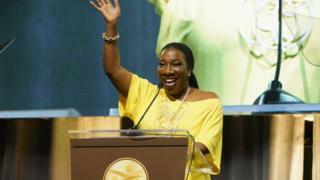 Tarana Burke, wey be di founder of #MeToo movement, dey write di book to explain why di movement dey necessary. From Hollywood producer Harvey Weinstein to actor Kevin Spacey, #MeToo na movement wey don make people lose dia job and popularity on top yabis say dia hand no pure for sexual harassment accuse against dem. Publishing house The Simon & Schuster Imprint 37 Ink tell America tori agency AP say Burke dey write di book with Asha Bandele wey go share her experience inside di book as person wey survive sexual harassment. "Where the Light Enters" na di book title and ego come out next year. Video How Africans see sexual harassment?